As a Pastor and a mother, I am often asked about Christmas and what we do as a family. This will be my ninth Christmas as a mother, and during this time we have developed a number of traditions and practices to help our children remember what Christmas is really all about. I hope sharing them may be helpful to you. 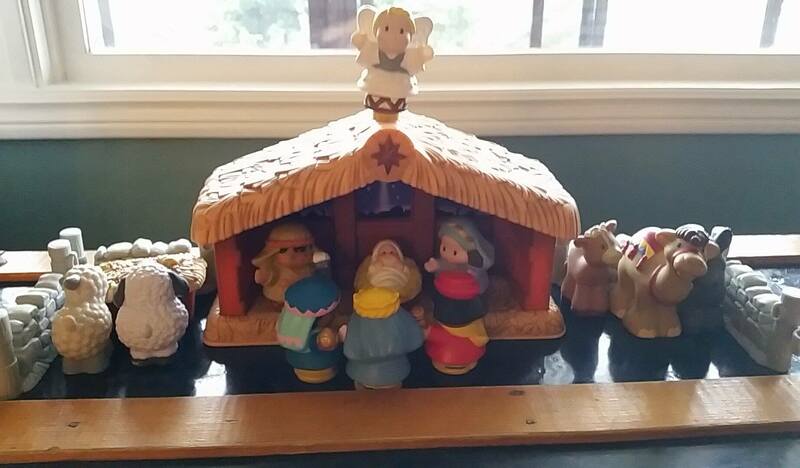 This one may sound obvious, but having a nativity set in your house is a great learning opportunity. When our son was two, we purchased the Little People’s nativity set. I can’t recommend these enough if you have young children. It is great for children to be able to play and interact with the story. The first couple of years we had it, he and I would often “play nativity.” I’d say the story and let him put the pieces in. By age 3, he could say the story of Jesus’ birth himself as he placed the characters in place. One of my favourite things is how my daughter has started setting up nativity scenes. Instead of arranging them like a display, she turns all the characters towards Jesus. I think she’s got it right! Kids can often teach us as much as we teach them. Advent is the season leading up to Christmas when we remember the waiting of those who waited for Jesus, and acknowledge our own longing for Christ to return. Almost everyone I know has an Advent Calendar – most often, the little ones you can buy with chocolate inside each day leading up to Christmas. We have a reusable advent calendar (see below) that I fill with treats each year, and each night we “do advent” together. On Christmas Eve, we make a cake together to celebrate Jesus birthday. We sing Happy Birthday to Jesus and eat the cake. This is a simple way to remind children why we celebrate Christmas. I am a real sucker for children’s books, and especially Christmas children’s books. 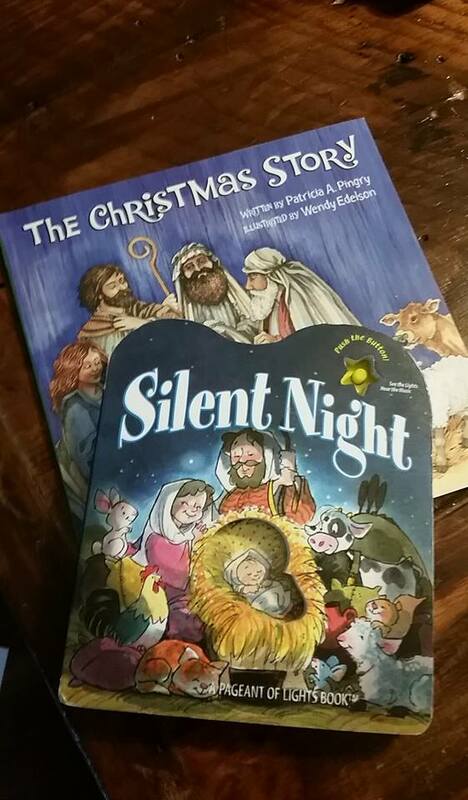 One thing that is important to me is to have lots of books about the Christmas story. These are easy to find (summer yard sales are usually stocked with Christmas books!) and a great chance for children to hear the story often. I read an idea that we started last year. I wrap up 24 of our Christmas books and they open one each day of advent for us to read together. By making sure many of these books tell the Biblical Christmas story, we get lots of chances to tell the story again and again. If you are a Christian parent, you may wrestle with what or how to integrate the many “other” traditions of Christmas that might seem to distract from its meaning. Santa Claus and Elf on the Shelf are good examples of this struggle. However, I believe we can enjoy traditions like these in ways that allow us to still focus on Jesus. I am not going to get into the question of whether or not Christians should receive gifts from Santa. I know Christians who choose not to use Santa with their kids, and it does not make Christmas any less special. I grew up with lots of Santa and it did not destroy my faith when I found out he wasn’t real. Zero judgement on either side here! However, if you choose to make Santa part of your Christmas tradition, you can still make it about Jesus. We have taught our children about Saint Nicholas and where “Santa” came from. We talk about how Saint Nicholas gave because he loved God. It is not about whether they or good or bad (I really shouldn’t get started on this, except to say that it astounds me how people will talk about Santa in a way that they will later use as a reason they don’t like God, ie. “I could never follow a God that judges people for how they live! But Santa? I’m totally cool with teaching my kids that he only gives gifts to those who are “good” and not to those who are “bad.” I don’t talk about God, or his followers – including Saint Nicholas – this way). As an aside, we decided early on that we would not consciously lie in regards to Santa. If our kids ask us a question such as “How Does he fit down a chimney?” we respond with: “That’s a great question. What do you think?” On Christmas morning, there is one gift with a child’s name on it and no label of who it is from. The kids draw their own conclusions! We also have an “Elf on the Shelf.” Again, we personally never talk about the Elf as spying on them to make sure they are good (see above!). We just have fun moving the Elf around. However, one of my favourite ways to arrange the elf a couple times during the season is to have her (ours is a girl) kneeling before Jesus in the nativity scene. Again, this turns the focus back on Jesus. Like many at Christmas, we look for ways to help others. We like to give through our denomination’s gift catalogue (Share the link? Don’t mind if I do!https://secure2.convio.net/cbmin/site/SPageServer/?pagename=Gift_Catalogue_Home.html%E2%80%8E) to help send children to school or provide goats or chickens for families. We like to give food to our Christmas hampers in church. We try to let our kids both see us doing these things and find ways for them to participate. If you give to others at Christmas, talk to your kids about it. Integrate them in the giving. Let them help pick the gift from the catalogue. Take them shopping when you buy the food for hampers. Let them see you put money in the “kettle” for the Salvation Army. What they see you doing models to them what is important. I’m not saying that we have it all figured out, but these are just a few ideas as the season starts. I would love to hear yours – please feel free to share in comments other ideas about ways to help children remember the story of Christmas. Leanne, I saw a nice idea on Facebook the other day. A kind of Advent calendar. The person used a compartmentalized box (I think it was a wine box) and each day they put an item in it for the food bank. When it was full they brought it to the local food bank. I absolutely love this idea Krista!! I would love the advent devotional! We did “truth in the tinsel” last year, and plan to do it again. The girls loved doing the activities! The Traynors and Holtens gave us the Little People’s Nativity as a gift when Nora was born 6 years ago. The kids love it, and so do we! 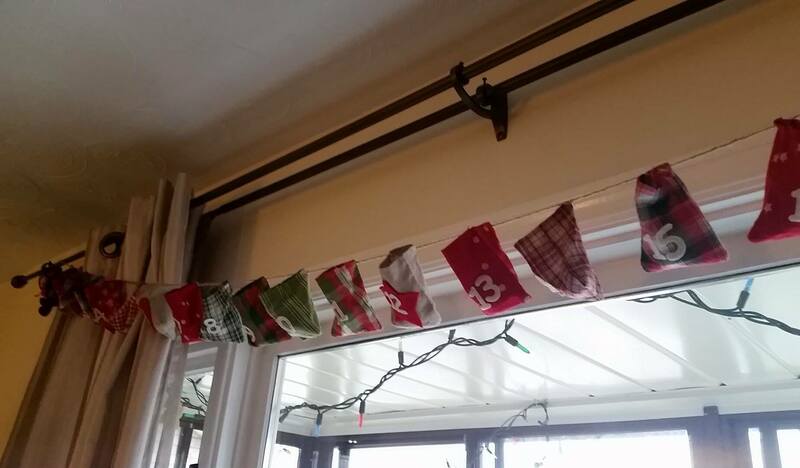 We also have a Little People’s one that hangs on the wall with pockets. Each night you bring out a different person or animal (little stuffed guys with velcro on the back) from the pocket and stick them on the creche scene. We’ve added verses with each of the people/animals that we read together each night.